Modular vs Manufactured | Excelsior Homes West, Inc.
Do you know the differences between Modular and Manufactured Homes? Our modular and manufactured home guides below should answer some of those questions. 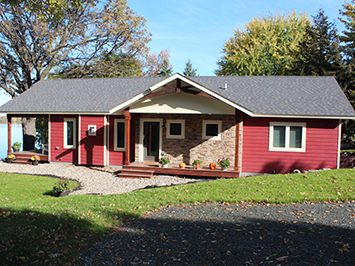 We sell Minnesota-built Modular and Manufactured Homes and Wisconsin built custom Modular Homes. Please use the modular vs manufactured guide below to help determine which type of home most fits your housing needs. Many of our floor plans can be built as a Modular or Manufactured Home. Questions? Contact us today! Also known as prefabricated, prefab, or factory stick built homes. Also known as singlewide, doublewide, triplewide, sectionals or mobile homes. Modular Homes are constructed to the same state, local, or regional building codes as a site-built home. Built according to the state construction standards act of 1976, known as Housing and Urban Development (HUD) code and displays a certification label on each section of the home. Built specifically for a basement or crawl space on personal property. Installed on frost piers, engineered slabs, or basements. Can be installed on personal property or rented/leased property such as mobile home parks or communities. Built in a controlled environment where no moisture touches the structure until completed. Built in a controlled environment where no moisture touches the structure until completed. There are many styles to choose from such as; rambler, multi-level, cape cods, lofts, 2 story homes. There are many sizes and styles to choose from such as; single section, double section or triple section, but can only be one level. Plumbing & Heating system is installed and completed on-site. Self-contained home with a furnace, water heater, ducts & plumbing all on the main floor. Usually less expensive per square footage than a site-built home with the same longevity as its site built counterpart, increasing in value over time. Generally, less expensive than modular homes. Affordable housing option. Financing is obtained the same as new construction / site built homes, through a mortgage lender with the same interest rates. Financing is obtained through a personal property loan or land/home packages. Your personal bank may be able to help you or a lender specific to manufactured homes such as Triad Financial Services or 21st Mortgage Corporation. We offer modular homes by Schult Homes, who is not only the oldest, but also one of the most respected in the industry. Stratford Homes and Dynamic Homes, our custom modular lines, are both leaders in custom home construction. 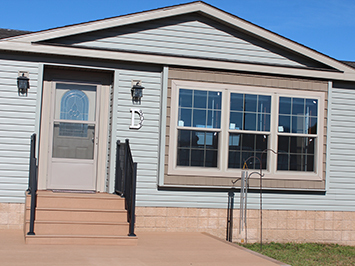 We offer manufactured homes by Schult Homes, located in Redwood Falls, Minnesota, a division of Clayton Homes, who is not only the oldest, but also one of the most respected in the industry. Are you ready to plan for your home?